There is danger inherent in commenting on work in progress. This is true of unfinished final works, but perhaps even more of work still unfolding from a living writer. The view from the outside may not reveal the whole of the project’s structure, or the full variety of notes which will be struck in the final product. Yet among the fragments it’s possible to glimpse remarkable things, fully realized moments that prompt impatience in the reader for the whole work, complete and refined. In recent weeks, the poet and translator George Szirtes has shared a series of, what? Aphorisms? Epigrams? Very brief poems? Couplets from a long poem? He has shared lines via his website and Twitter. 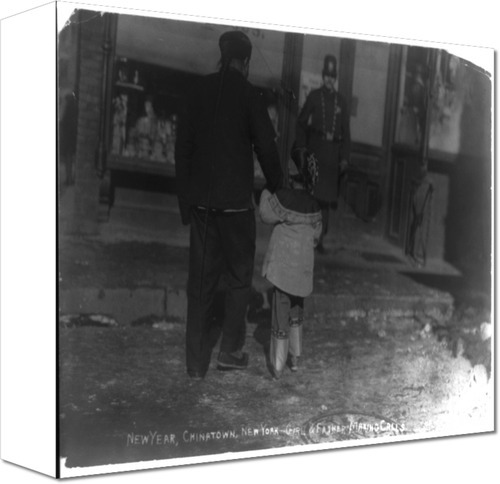 The series comes in response to an old photograph of a Chinese-American girl and her father making New Year’s visits in early 20th century New York. Thus far Szirtes’ efforts hav run under the title “Child Helga and her father” on Szirtes homepage. In fact I’m making a number of inferences here. Szirtes concedes that he doesn’t have a specific, firm plan for the lines at this juncture. “I wish I knew. I carry on writing these things and maybe there’s a way of publishing them,” he told me via Twitter. There’s no evidence of whether they are individual, very short verses or part of a longer work. There’s also no indication of what length that work would run to if completed. What is a ballad, asked Child Helga. The king sits in Dunfermline toon, then something bad, then something worse, said her father. What is a sonnet, asked Child Helga. Fourteen years of your life, said her father. What is a villanelle, asked Child Helga. Fingernails with fine manners, said her father. What is translation, asked Child Helga. Elephants in clouds, shadows dancing, a downpour of fine particulars, said her father. grumbled her father. I like a bit of dusk in the hall. Where does the grass go at night, asked Child Helga. It runs into the fields and spreads all kind of gossip, said her father. What is silence, asked Child Helga. I have a small box of it in my pocket but you might have to imagine it, said her father. Why do my nails and hair keep growing, asked Helga. So you may have a house to live in if all else fails, said her father. Each verse is a small jewel, worthy of being turned in the hands, examined from a range of angles. The lines are often playful but never quite nonsensical. I’m drawn to their gentleness, and a purity running throughout. The sum of these efforts, thus far, is a clear sense of a father’s love for his daughter, a matter Szirtes conveys without anything in the way of characterization or, really, narrative. “Who made the world, asked Child Helga. I did, said her father, but now you have to remake it all over again.” I don’t know if there’s anyone who fills the Child Helga role in Szirtes’s life, or who did once upon a time. Nor do I know if she is capable of remaking all over again the world her father made first. Szirtes is a formidable translator (does formidable do him justice after Satantango?) and a poet of surpassing skill. An heir to all that is maybe too much to ask. If so, I’m satisfied with his work so far. And for the moment, “Child Helga and her father”, however improbably, has pride of place.